And here's by far my first lipstick review of 2016!!! Woohoo! 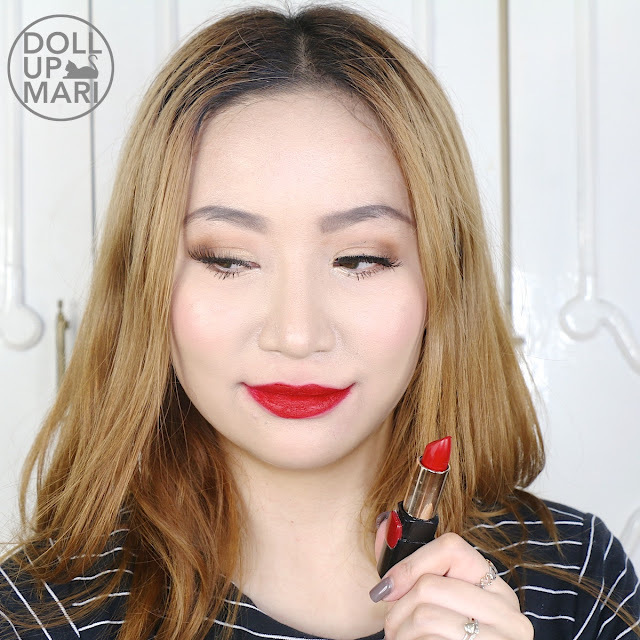 And I'm starting this reviewing year with a bang with this suuuper wild, suuuuper vivid, suuuuper shocking red lipstick from L'Oréal! This is their Color Riche Sensation lipstick in the shade of Pure Rouge. This also happens to be a special collection one, coming from the Collection Star (made with Freida Pinto). The packaging is suuuper sleek. It reminded me of Armani lipsticks, which BTW is also owned by L'Oréal. It's a shiny onyx black with a little red tile on the front. 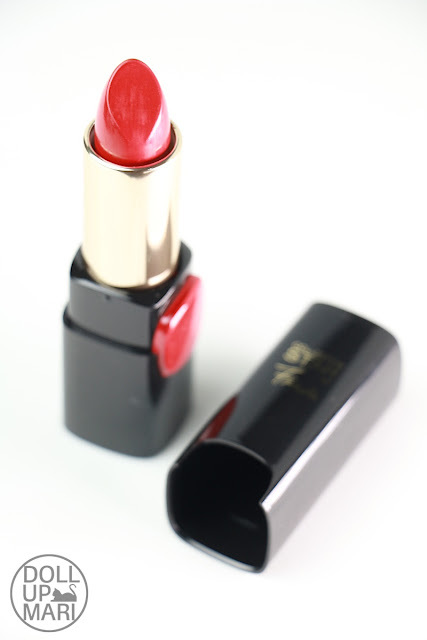 I really appreciate the red tile because it's a great leap from the L'Oréal lipsticks of yesteryears. My mom has long been a L'Oréal lipstick girl and she'd always have a hard time knowing which is which because there was no external indicator of the shade. Reading the small text was also hard for her, which is why this is a nice touch to the product. It actually doesn't feel like plastic. It feels like a sleek black metal, despite being probably plastic (?). 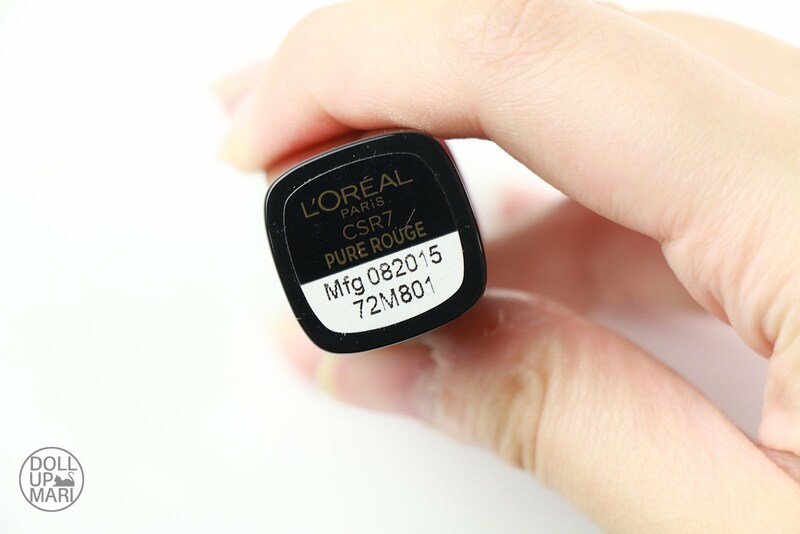 Indicated on the bottom of the tube are the shade name and production date. And here are the ingredients. This is how it looks like. I know it looks a bit orange-ey in this shot, but I swear it's not. It's an attention seeking blue based red. And yes this is what I mean by an attention seeking blue based red with touches of pink. It's so strong that any area of the skin it comes into contact with will really have a pink tint afterwards. I had to wash my hands several times before I got all the pink off after taking this swatch. This is how it looks like on the lips. I didn't use any lip liner or lip primer for that matter. Up close there are a lot of pinkish blotches on the sides because it really is THAT potent. Extreme (or if there is an adjective even greater than extreme, that's probably what I mean) care and caution must be taken during application in order to not apply this on the sides of the lips. I didn't know of this and just applied it using the lipstick itself and tried to rub off the excesses. But well, this happened. 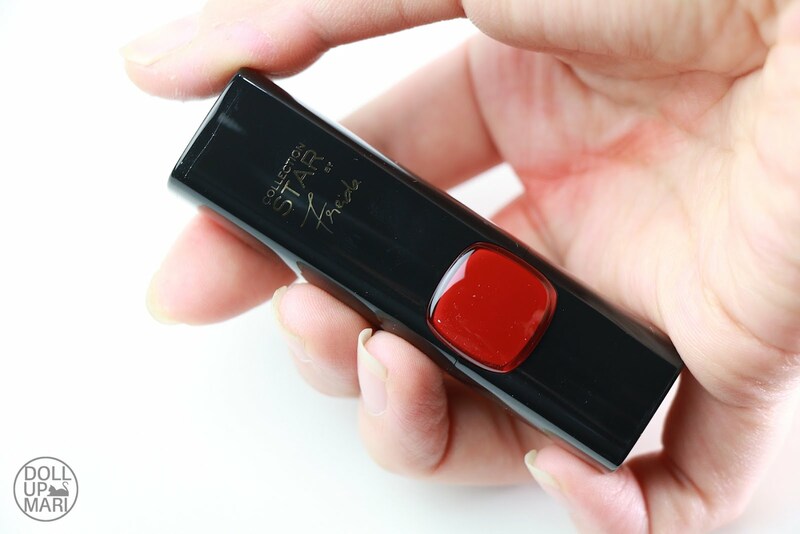 After using it, I now understand that this will work best with a precise lip brush, or with a liner, in order to achieve really clean results. But I am very happy that it doesn't move and stays put on the lips. 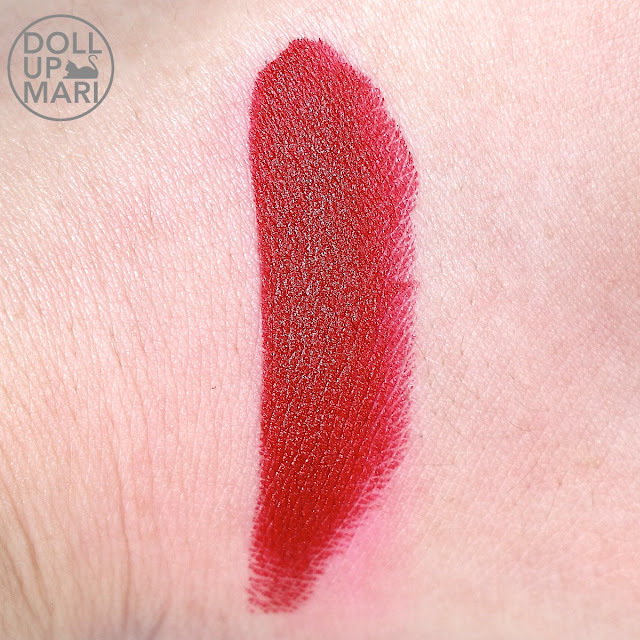 It's got a texture that is comfortable, but you can feel that it coats the lips very well and it doesn't move around a lot. It also does not transfer to the teeth. This color in particular also makes the teeth look good, so if you have yellowish teeth you may want to use this as an affordable cheat when you don't have the time or resources to get teeth bleach yet. Finish wise, it is a silky, luxurious matte. It's not as matte as liquid lipstick, but compared to most 'matte' lipsticks, this is more matte. It's also a very, very opaque formulation, which I am thankful for as it covered up all the dry blotches of skin on my lips. Close up, you can see it in the cracks and crevices, but from afar, it's not obvious at all. I think this is what I mean by opaque. The moment you apply it, everything in its path will really get covered up. Application was actually very fast as I didn't have to go through a second or third swipe to get the opaqueness in these photos. From afar, it looks really matte and elegant. It's a very, very shocking color, and these photos actually do no justice to how shocking it is in real life. 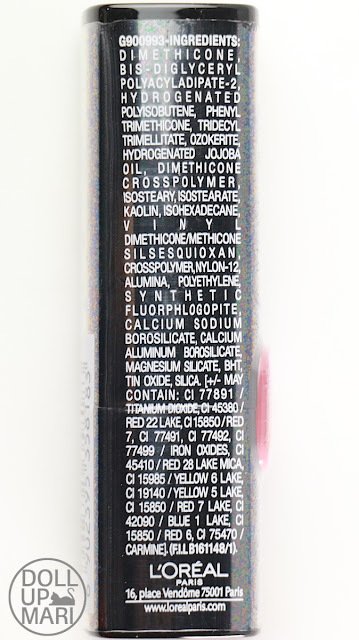 I wear this lipstick when I'm very tired and need something to brighten up my whole look and it really does its job. 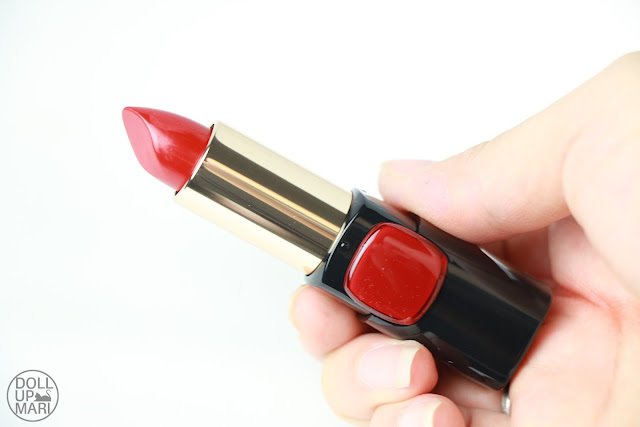 In terms of staying power, this lipstick stays put for hours and doesn't wear off when you have something to drink. Assuming you will tissue this off (does that verb even exist hahaha), be prepared for a difficult time as this will not come off easily. Its color really stays put. However, it does wear off quite fast when you eat. I'm not exactly affected, though, because it leaves such a nice tint that you can top it off with gloss (like what I did in this photo) and sport your second look for the day. And yes, this is what I mean by strong color payoff. This is already after wiping the tint from the previous photo. 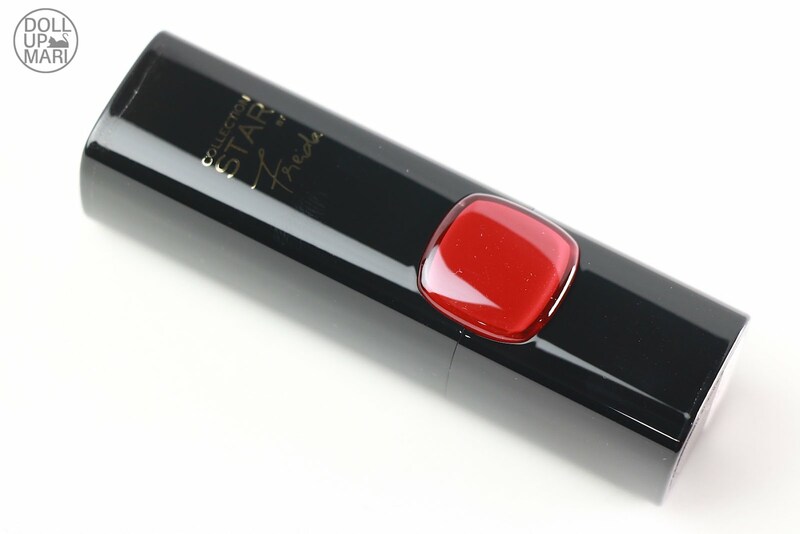 This lipstick really packs a good value for money because it can work as tint and lipstick. And if you're not really intent on keeping the whole shocking red lip look, this will leave a nice tint for the whole day. Overall, while I am a pink lipstick girl, I appreciated the color payoff and comfortable and luxurious texture of this lipstick. I wish it didn't wear out so fast while eating, but at least it leaves a nice tint. You can get these lipsticks at Php400 a pop at L'Oréal Paris makeup counters nationwide.